Moments ago, Filipino sensation Nonito Donaire proved why he's one of the best pound-for-pound fighters in the world, stopping former bantamweight king Fernando Montiel in the 2nd round of their highly-anciticpated showdown at the Mandalay Bay Resort & Casino in Las Vegas, Nevada. Using his height and reach advantage, Donaire was able to keep Montiel at bay with a stiff jab and superior technical skills. Although Montiel was game, he was never able to get close enough to land anything of significance before Donaire caught him with a beautiful counter left hook. Relive all the action in FightHype's in-depth, minute-by-minute round-by-round results. The challenger, Nonito Donaire, makes his way to the ring first. He looks confident and excited to get the fight started. The champion, Fernando Montiel, comes out next. He looks extremely focused and intense. Donaire comes out firing his jab. Montiel looks cautious. Hard left hook to the body lands for Donaire. Nice left hand lands for Donaire. Montiel backs up. Montiel lands a quick jab to the body. They trade jabs. Both men showing some respect for each other. Straight right from Donaire grazes Montiel. Left to the body lands for Montiel. Donaire answers with one of his own. Not too much action, but round to Donaire. Nice 1-2 lands for Donaire to start the round. Uppercut lands for Montiel, but he eats a right in return. 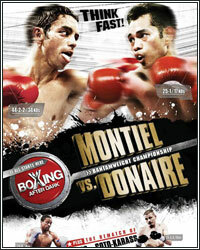 Donaire sticking his jab in the face of Montiel. Jab lands for Montiel. Anoteher. Left hook to the body lands for Montiel. Counter left lands for Montiel. Right hand lands for Montiel. WOOOOOOOO....HUGE counter left hand from Donaire FLOORS Montiel. He's down. He takes the count, but he looks wobbly. Donaire jumps on him and lands another couple of shots for good measure. That's it. It's over. The ref calls a halt to the bout. Wow!